We had been working on an offshore project in Gabon for several months; every five weeks flying out to or back home from the ship. 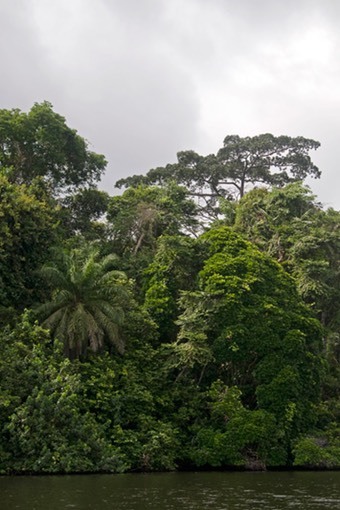 During our flights across the country we could see endless tracts of apparently unspoiled rain forest, which, for us land-starved seafarers, was most intriguing. 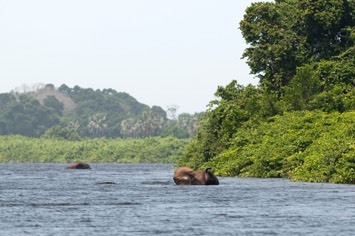 So we decided to stay behind in the country for two weeks after our final five-week rotation and go in search of western lowland gorillas, chimpanzees, mandrills, forest elephants and surfing hippos. 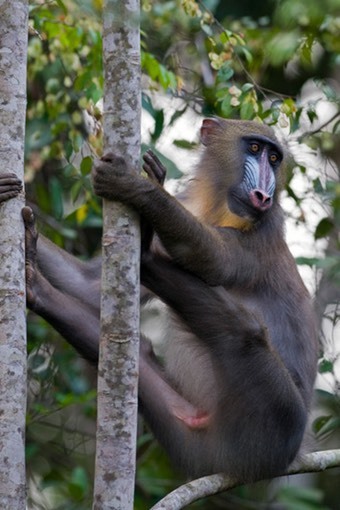 While on the ship, we searched the internet for the best places to see these animals and decided that we would like to visit Loango National Park on the coast, Langoué Bai in the Ivindo National Park and Lopé National Park upcountry, where you can go tracking a group of habituated mandrills. We got in touch with Mistral Voyages (http://ecotourisme-gabon.com/mistral/en/home.php), a travel agent in Libreville, and Patrice, the owner, told us that Langoué Bai was no longer open for visitors and it was also impossible to visit Loango, as the lodge and the park were closed, due to some dispute between the owners of the lodge and the government over the use of the airstrip. 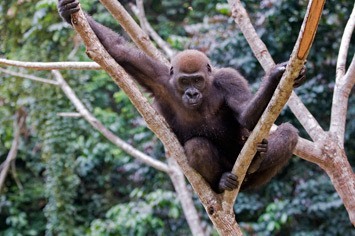 He suggested visiting Setté-Cama, just south of Loango National Park instead. Some time later it turned out that it was also impossible to visit Lopé, as both lodges in this park (owned by the same person!) were closed for renovation! This was very disappointing, as it seemed to be the most promising place for seeing the primates we had hoped to see. 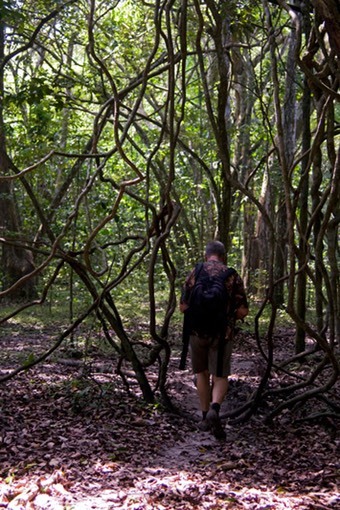 The suggested alternative was trekking ten days through the rainforest in Ivindo National Park to visit a bai (a large, open clearing in the forest, often with marshy ground), which sounded great, but we were just not prepared for that sort of adventure. Another alternative presented itself in the form of the Parc de la Lékédi in the far south-east of the country, close to the border with the Republic of Congo. 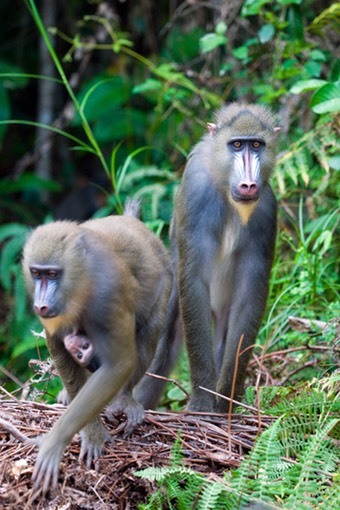 This is a park that is being restocked with animals from other areas and one has the opportunity to see orphaned gorillas and chimpanzees as well as a group of radio-tracked mandrills. We decided to go for this, as we really wanted to see some apes. 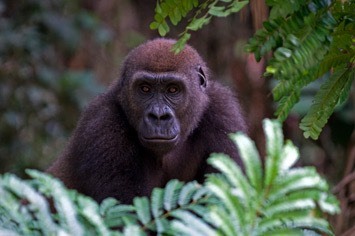 The chances to do so in the national parks appeared to be rather slim, as there are no habituated groups of gorillas in Gabon (at least none that you could visit at the time). 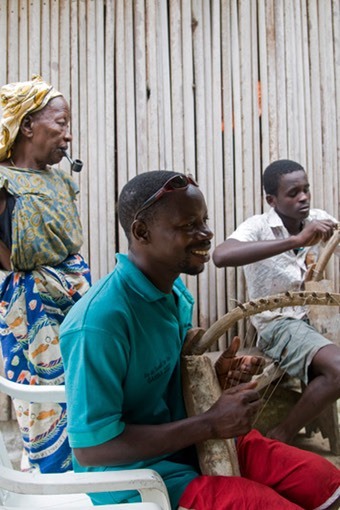 So we asked Patrice to book two days in Lékédi, followed by seven days in Setté-Cama. Then things went very quiet and, when we still hadn’t heard anything just a few days before leaving the ship, we called Patrice. It turned out that he had gone to France and didn’t tell his office staff to look after our travel arrangements! Fortunately, everything was sorted out in the remaining days. When we arrived back in Libreville, we stayed the night in the small Le Patio Hotel. After sitting on a helicopter and a plane for several hours, we were looking forward to a shower – only to learn that there was no water for the next several hours! There was also no food available in the hotel (except for breakfast), and all the restaurants nearby were still closed. The air-con in our room was playing up, so a technician was called in and we didn’t want to leave our things unsupervised. So we ended up without dinner, but at least we could have a shower in the end! The next day, our driver François collected us from the hotel to take us to the airport, helping us with the check-in and seeing us through the security check. The plane was surprisingly big for an internal flight and we could choose our seats after boarding. 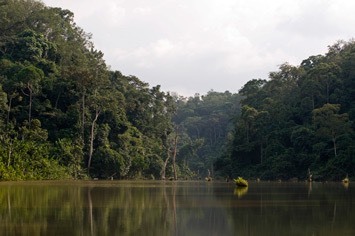 We crossed most of the country heading east, with great views of the rivers and the rainforests. This all changed, when we approached the airport of Franceville – we disappeared into one vast, grey raincloud! The rain hadn’t stopped when we got of the plane, and, as nobody seemed to know where to go, we ended up wandering around in the rain looking for the “terminal”. This turned out to be one big shed, where fortunately somebody was already waiting for us. It took an age for our bags to arrive before we set off in a small van. We stopped in Moanda for a quick rest stop (no water here, too!). The drive to Bakoumba, just outside the Parc de la Lékédi, took a couple of hours and when we arrived it turned out that we were the only visitors! The hotel had a big building with a bar, eating area and a small exhibition and shop. Our room was spacious with a double bed and the bathroom had a shower with cold water only. The water was turned off during the night, as we found out the hard way. No showers if you stay out too late! Soon after arriving we sat down with the manager, Arnaud, and discussed our programme for the next two days. He asked what we wanted to do, so we said that, if at all possible, we wanted to see gorillas, chimpanzees, mandrills and red river hogs (there are no forest elephant in Lékédi). 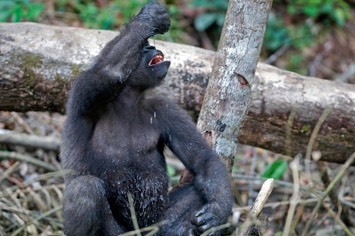 To our surprise, Arnaud said “No problem, gorillas, chimpanzees and mandrills it is! How about doing an introductory game drive tomorrow morning, and see the gorillas in the afternoon. 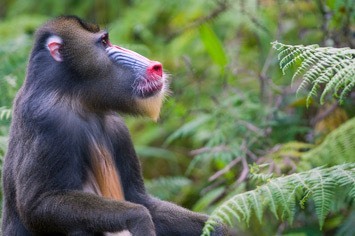 The next day you go to see the chimpanzees in the morning and go tracking the mandrills in the afternoon?”. We looked at each other, thinking that surely something had gone wrong with our translation from French to English, because we didn’t expect any of these sightings to be guaranteed. Well, little did we know! The next morning we started our game drive around 8:00. We were told that there was no point in leaving earlier, as it was still a little foggy and quite cool. 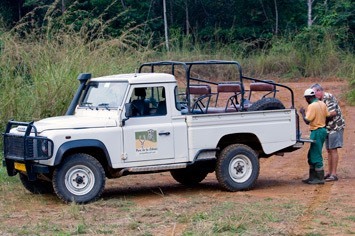 Our game drive vehicle was first a Landrover pickup with a triple row of seats put on the back. These seats weren’t even fixed to the vehicle, as we discovered when bouncing over some rough roads! During our subsequent game drives the seats were moved onto the back of a Landcruiser pickup. It took about 25 minutes to reach the entrance of the park. On the way, we passed through a couple of villages, and everybody - especially the children - waved at us. We felt a bit like royalty, waving back at people for most of our drive. The first big mammals we saw were forest buffalo. 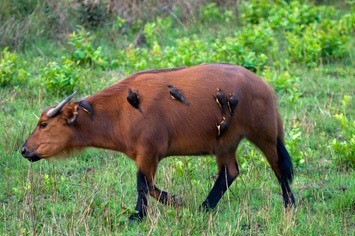 Smaller, redder and less aggressive than their savannah counterparts, they swarmed with ox-peckers feasting on ticks and other blood-sucking insects. We were wondering if we could tame one these birds to deal with the mosquitoes whizzing around us. The game drive wasn’t quite what we expected, as the park turned out to be fenced and split into different areas. There was a “buffalo area” and an “impala area” (imported from South Africa), so the driver knows where to find certain animals. 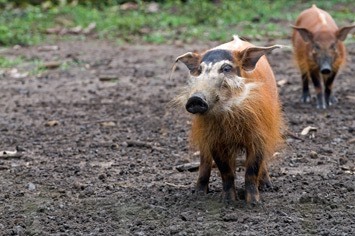 There is also a compound where some red river hogs were kept, as these animals are otherwise notoriously difficult to find. They are really splendid looking, rather cute critters, and some even came to the fence to sniff our hands. We felt guilty seeing them being kept as prisoners for the sake of the tourists. 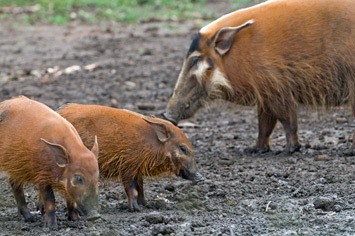 However, it turned out that these would be the only hogs we saw – in the wild we would only see their footprints and wallows. Compared with game drives in East Africa, this was relatively uneventful to start with. Our driver then stopped at a very scary-looking wire bridge about 300 m long. 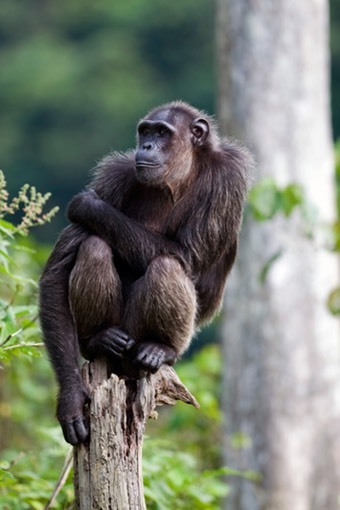 It went over a densely wooded valley, in which there were apparently chimpanzees. To prove his point he did a pretty good Tarzan imitation and sure enough got an answer from an individual named – guess? – “Tarzan”! Now we had little choice but to venture onto the bridge, especially as we were told that even the late president Ali Bongo had done so. So, with his seal of approval, there was no way back! Our driver however preferred to stay on steady land! 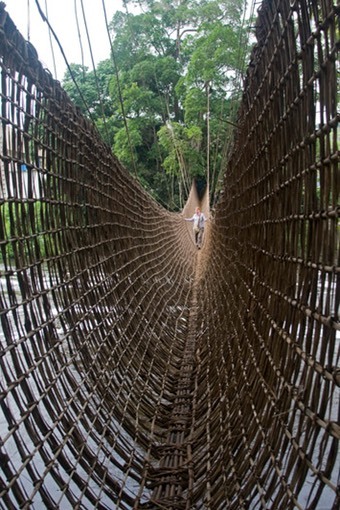 The bridge was indeed very scary, and got scarier the further one went, as it started swinging and you could see the ground disappearing further and further below… No way would Maren go all the way across, especially as it meant coming all the way back as well! After about a third of the way, she decided to chicken out! Mick went on a bit further, but from the calls of the chimps, it was clear that they were not on the other side of the valley, so he returned as well. 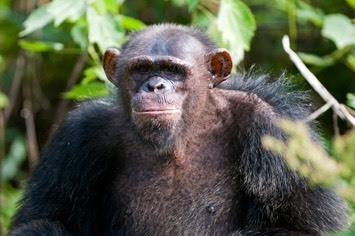 We then drove on a bit and came to a large, fenced compound, where there were seven young orphaned chimps. Kept in the compound for safety from the wild chimps in the surrounding forest, they were fed with bananas and their behaviour was being recorded by a young French guy, who told us a bit about them. 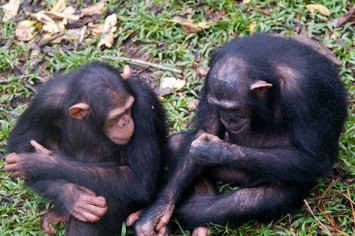 But even the youngest chimpanzees already looked incredibly wise. Poor Tarzan turned out to be locked up in a cage. After lunch and a siesta back at the hotel, we set off for our second game drive, this time hopefully to catch a glimpse of a western lowland gorilla. We drove through the park to a flooded river valley, where the river had long ago been dammed by a causeway used for manganese extraction, the raised water level creating many islands in the river. We went off in a small boat with a quiet electric outboard engine. 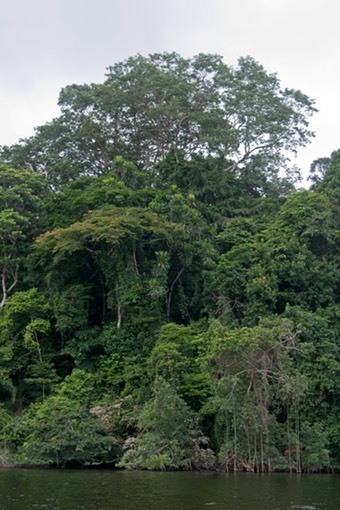 It was amazing to see the very dense rainforest come right to the edge of the water. We caught a glimpse of a monkey in the top of some trees, but it was impossible to keep track of this agile little animal. We were wondering how on earth we were supposed to find a gorilla in all this greenness, when suddenly there he was, standing right next to the shore, looking at us! This first eye contact is impossible to describe – it is simply amazing and still makes my spine tingle writing this now. Western lowland gorillas develop a very fetching red hair cap when reaching adulthood, and this one already showed the beginnings of one. He moved parallel with our boat, and when he came to a fallen tree sticking into the water, he climbed onto it and showed himself in all his glory! We were told that this was five-year old Djino and that he and his two four-year old friends, called Yenzi and Rafa, were being rehabilitated on this island after being sadly orphaned. 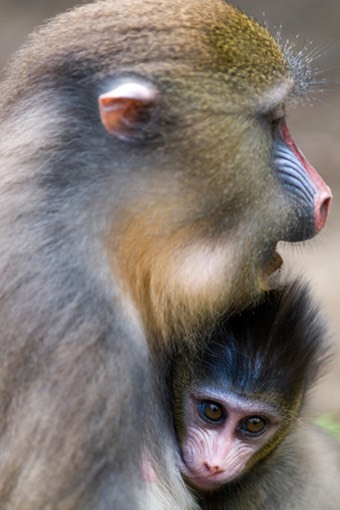 The two smaller orphans apparently were still quite wary of humans (and who can blame them! 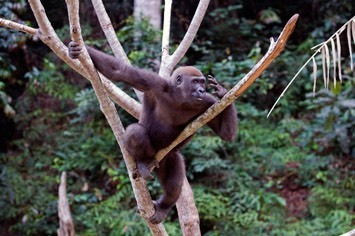 ), but Djino was a star performer and enjoyed showing off. Maybe he was hoping for a part in a movie? He certainly had talent and it was obvious that he will be a very handsome dude when fully grown! 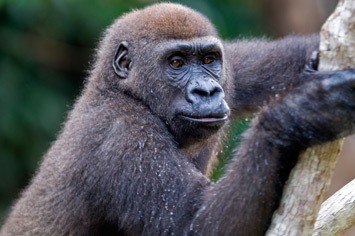 He climbed onto a thin tree and watched us from a height and every time we stopped paying attention to him, he would do the gorilla thing and beat his breast! He certainly didn’t like sharing our attention with his two friends. 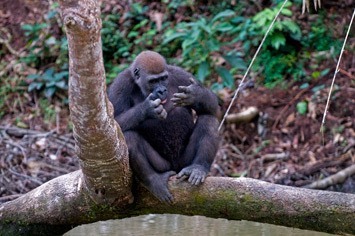 He briefly climbed down the tree to dangle his feet in the water and show us how gorillas drink: by sticking his hand in the water and letting it drip into his mouth from the wet fur of his raised arm. Then he climbed back up and our guide managed to manoeuvre the boat right underneath the tree. We were only a couple of metres below this amazing animal, who was looking at us just as intently as we were looking at him. 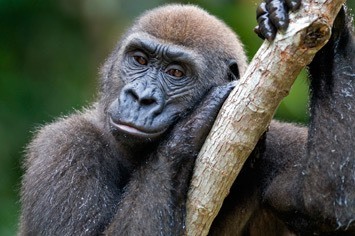 At times he appeared very contemplative - was he thinking about his long lost mum or maybe day-dreaming of an ape-girl and how he would impress her with his climbing skills? Silly, but my biggest worry was that he would pee down on us… Fortunately, this didn’t happen, and eventually he came back down the tree and went off into the forest with his two friends. We were completely awestruck, as we hadn’t really expected to see a gorilla, let alone get so close to one! The spell was soon broken though, when our guide called out and a voice answered from the forest. It turned out that the three gorillas had a keeper with them, and our meeting hadn’t happened quite as coincidentally as we had thought! Nevertheless, it remains one of our most memorable wildlife encounters! After returning from our successful gorilla trip, the heavens opened soon after our return to the hotel and we had to seek shelter inside. It really chucked it down, together with thunder and lightening and a power cut! Despite the downpour, we took dinner outside under an almost waterproof thatched roof. 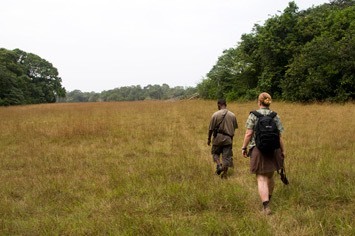 The next morning we set off to try our luck with the chimpanzees. We went to another part of the flooded river valley, where a boat was waiting for us on the shore. This time it wasn’t just us and our guide on board; we also carried a big bag full of bananas! We hadn’t been going for long when we spotted some interesting ducks off to one side, and, while distracted by them, we didn’t notice that we were already approaching the chimpanzee island, with the chimps waiting at the shore! 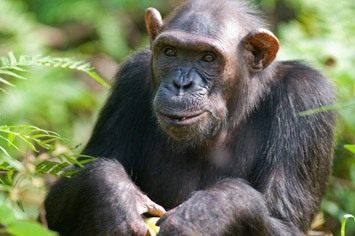 There were four chimps in total: two males and two females. They were all orphaned and were being rehabilitated on this island. But as they were older than the ones we had seen on the previous day, they could, essentially, fend for themselves. We were fascinated by the different personalities of the chimps: some looked quite charming, but one of the males looked like a seedy night-club bouncer! You wouldn’t want to met him in a dark alleyway! Unfortunately, we hadn’t quite thought through the implication of the bananas, and, after a couple of minutes, our guide was throwing them at the chimps. 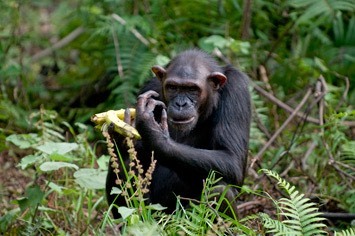 For us, that was the end of taking photos of chimps in their natural habitat, as they were now all collecting as many bananas as they could possibly hold. It became clear that the sound of our boat must have been like a Pavlovian dinner bell for them. 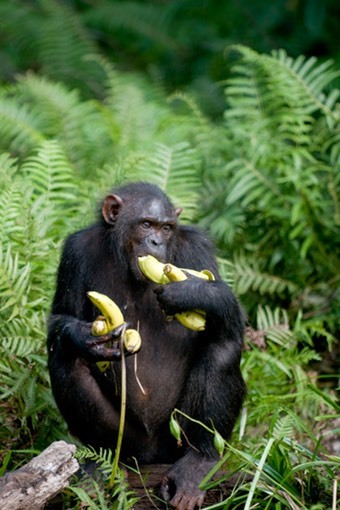 Once the bananas were all gone, so were the chimps. So our visit to the island was rather short, and nowhere near as emotional as visiting the gorillas, despite chimpanzees being our closest relatives. Afterwards we pottered over the river a bit longer, watching African fish eagles, palm-nut vultures, darters and kingfishers. 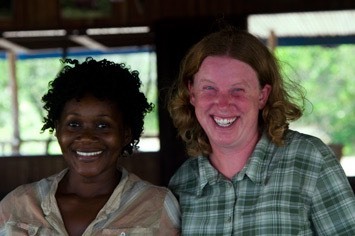 When we returned to the hotel, we were greeted by two new guests from France, who were visiting relatives in Gabon. They joined us for our afternoon trip to see the mandrills, but, as we knew the score, we quickly grabbed the best seats in the front row in the back of the pick-up truck. 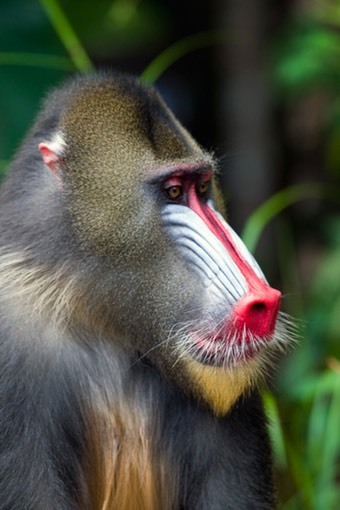 We had been told that some of the mandrills were radio-collared, so that it would be possible to pin-point the location of the group. 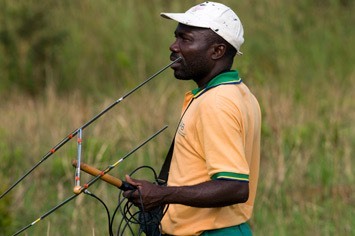 We drove through the park to an area overlooking a wooded gorge, where our guide got his radio-tracking equipment out. 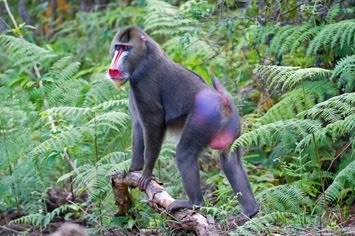 He waved it around a bit, but there was only a weak signal from the mandrills. So off we went, down into the gorge, where we stopped right next to a path coming out of the thick undergrowth. 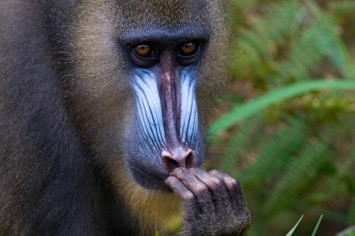 This time there was a strong signal, and, after a short warning that we shouldn’t crouch down near the mandrills, we got out of the car. 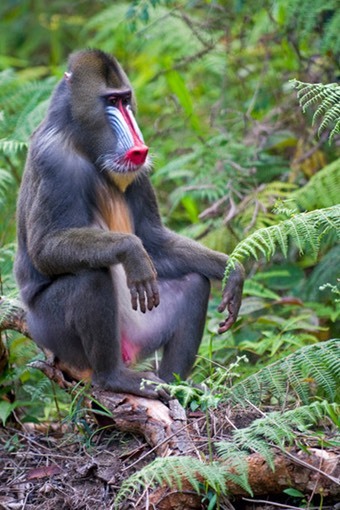 Another sack of bananas was produced, some apelike noises were made and then it didn’t take long for the mandrills to come out of the forest. 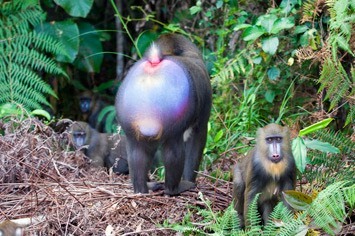 First came the females and young, who look quite spectacular with their coloured faces. 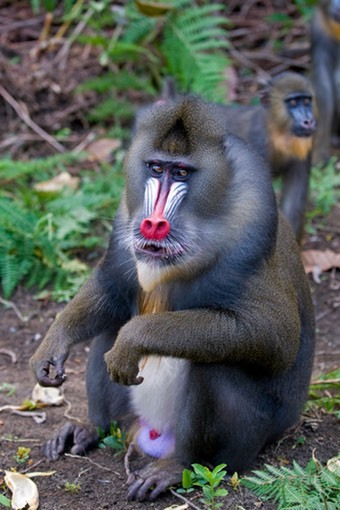 These mandrills were elegant baboons with long, sensitive fingers, but a fearsome set of teeth! The youngsters had cute punky hairstyles, and the young males were already learning how to show off their private parts to best effect. But then two mature males appeared, and they were truly stunning! 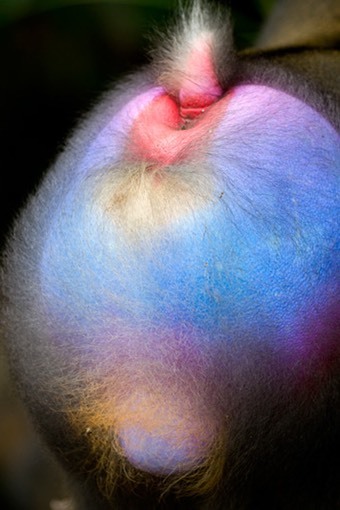 Not only are their faces very colourful, but also their backsides! 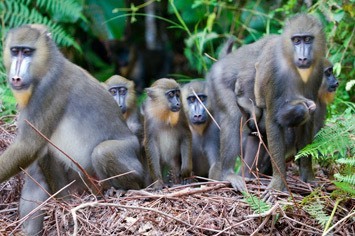 The ladies were obviously impressed, except when the males used their authority to get as many bananas as they could! 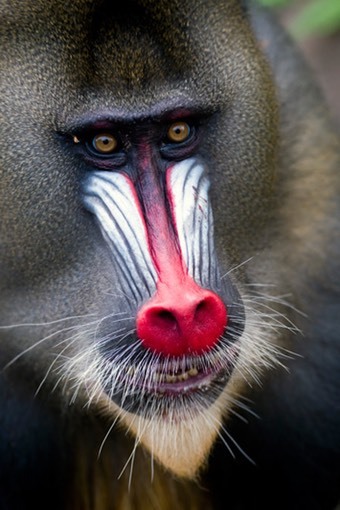 This troop of mandrills was living a truly wild life, but obviously they were habituated to being fed with bananas and they were swarming fearlessly right around our feet! But as soon as the bananas were gone, their fascination with us was gone, as we obviously had nothing else interesting to offer. 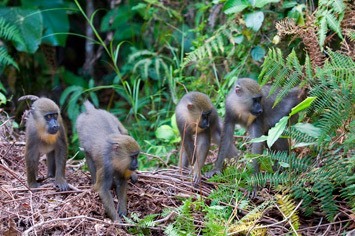 The mandrills disappeared into the forest again, but this time we were allowed to follow them on foot for a while. 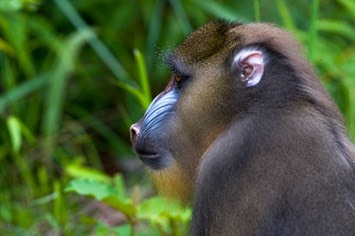 The going on the ground wasn’t easy, due to the thick undergrowth, and the mandrills soon disappeared into the trees. And so ended our stay in the Parc de la Lékédi. The hotel was good, the food was basic but plentiful – both lunch and dinner were three course meals. The people at the hotel and our guides were pretty friendly, but they spoke only very little English, so all conversations were in French. We very much enjoyed watching the gorillas, chimpanzees and mandrills, but we couldn’t help feeling that the whole experience was a bit like being in a zoo, where you can see all these animals on demand. It clearly is not comparable with being in a National Park, but if one has only little time available, it is probably quite a good alternative to seeing the animals “in the wild”. But would we go there again? Probably not. The next day we set off after breakfast to head back to the airport in Franceville. On the way there we made a short detour to visit the second mandatory scary bridge. 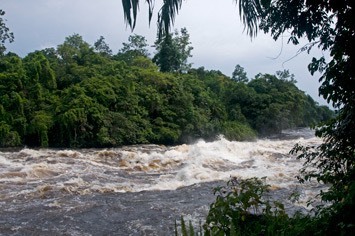 This one was a liana bridge over the Oogue river, the biggest river in Gabon, which was a raging torrent at this point. We were assured that the lianas were changed every year, but there were a few holes in it already! However, it actually felt a lot more secure than the wire bridge in Lékédi, as the sides were much higher. But with the water flowing fast underneath, it made it feel as if we were moving on the bridge, rather than the water underneath. Our driver wouldn’t take no for an answer and made us cross it. They cleverly charged the “crossing fee” only after we crossed, so in order to return to the van and continue to the airport we had to pay! The plane taking us back to Libreville was late, and, when it eventually turned up, it was a lot smaller than the one from our earlier trip. It was a bit of a struggle to get our big camera backpacks stashed away, but having seen how baggage gets dealt with at Libreville airport, we didn’t fancy putting all our equipment into the hold. Despite the delay, our driver was waiting for us at the airport. This time we stayed in the Hotel Tropicana very close to the airport. The hotel was right on the beach, so you could have your drinks while watching the sea. We were given a room with a double bed and even some hot water coming out of the shower! However, when we left it for dinner, the key broke off inside the lock! The man at reception was not very happy, and told us he would give us another room for the night and get it sorted out tomorrow! We declined the offer and asked him to get it sorted straight away, as there were things in the room that we needed. He grudgingly called the manager, who showed up some two hours later and then fixed the problem in a few minutes. Phew! Today was Mick’s birthday and we had hoped to spend it somewhere a bit more exciting than Libreville. But due to the limited flights to Gamba, we were stuck for the day. So we took it easy and went into town for a bit of sightseeing and shopping. 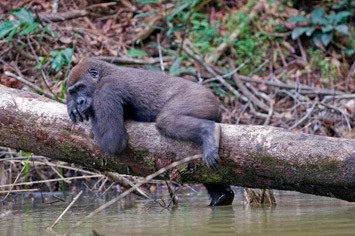 Gabon is very relaxed, and there are virtually no hustlers around. We had a nice meal in the hotel in the evening, but had an otherwise uneventful day. Although the hotel is in a great location, it has its seamier side. Every evening young ladies in very minimal clothes walk past the tables looking for business. Some were happily taken up by very unsavoury looking European characters. We discovered on our first night that, if you’re unlucky in your allocation of a room, you can hear them working furiously in the room next door. The first afternoon we went for a short walk, just behind the lodge. 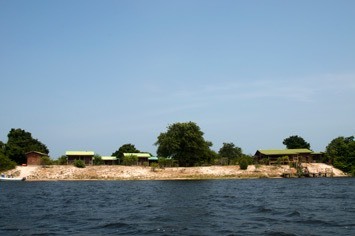 The lodge is located on the shore of the very labyrinthine Ndogo lagoon, but it is only a few hundred metres across a sandy strip to the Atlantic ocean beach. And there was evidence of elephants even right behind the buildings of the lodge, although on our first walk we didn’t get to see anything other than birds. 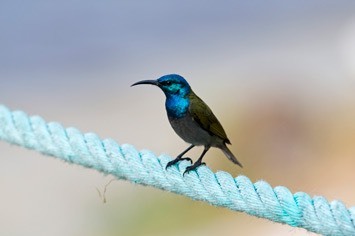 But the birds in Setté-Cama are spectacular! We returned to a nice fish dinner made by Annie, our cook. She would look after us very well for the duration of the trip. 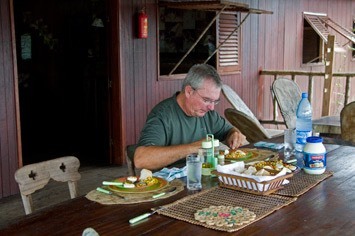 All food had to be shipped in from Libreville and Gamba, so most days we had at least one meal of freshly caught local fish! The next six days have all blurred into one big adventure, which we are not going to try and distinguish here too much. 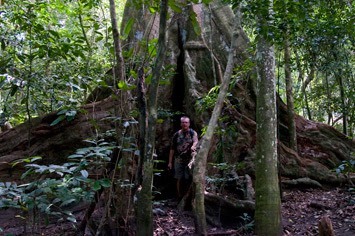 We went for walks in the rainforest in the morning and on the beach or in the forest again in the evening. We would set off around 8:30 in the morning, returning for lunch and a siesta and then set of for a second walk around 16:00 until sunset. For the morning walk we would first go by boat that would take us to some place along the lagoon, where Jean-Alain and we would get off and walk, returning to the boat some hours later. Usually one or two other guys came along, looking after the boat in our absence and trying to catch some fish for dinner. 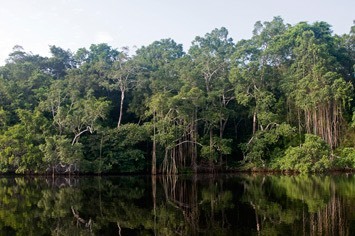 The rainforest around Setté-Cama is amazing, it’s really dense and very green and it starts right there at the lagoon. 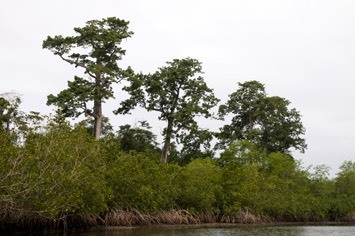 In some places there were creeks lined with mangrove swamps. 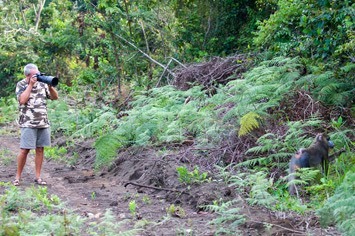 Tracks of elephants were everywhere, but for the first couple of days all we got to see were birds and some monkeys. The monkeys were very wary of humans, so we guessed that there was probably quite a bit of poaching for bush meat going on in the area. It was difficult to get a decent view of them up in the trees and we failed miserably to get any decent photos. One morning we came across a big ant trail, and it was incredible how these guys latched onto us and bit us! Our only hope was to run as fast as we could, get away from them and then pick the remaining ones off our bodies! The lagoon is the home of secretive manatees, of which we unfortunately only saw the “footprint” on the water’s surface made by one. 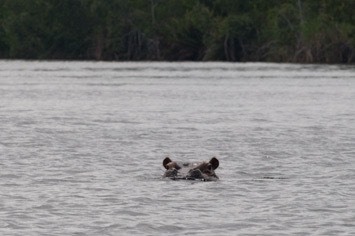 Loango’s hippos are famously known to surf in the sea, but we never saw them venture out of the lagoon. 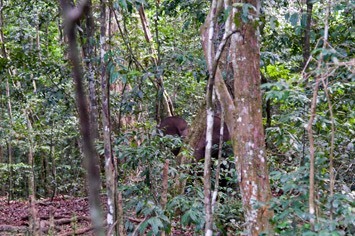 It wasn’t until our fifth walk that we finally found our first forest elephant! We know full well that you never know what you might be lucky enough to encounter in the wild, but we so wanted to see these guys! 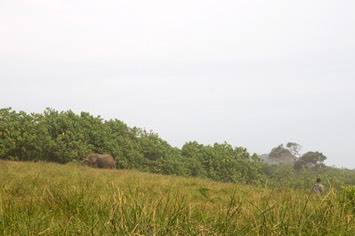 We could see Jean-Alain getting more and more desperate after every walk without elephants, so he was greatly relieved, when he could show us a back and a flapping ear in the bushes bordering the beach! And after that, the spell seemed to be broken and we saw many more! It was surprising, though, how these huge animals could just disappear in the bushes. One moment they were there, and the next moment they were gone and you wouldn't have had the faintest idea that there was an elephant nearby! 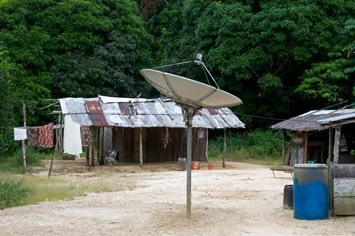 In comparison, bird watching was a lot easier, although in the dense rainforest it was still quite challenging. 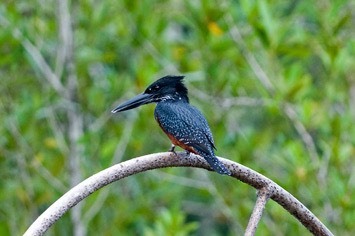 However, we could do a lot of bird watching from the lodge while having lunch and during our siesta break. Kingfishers would whizz around all the time (a woodland kingfisher in the picture on the left and a giant kingfisher on the right), and the sunbirds would visit the bushes outside the terrace every day. 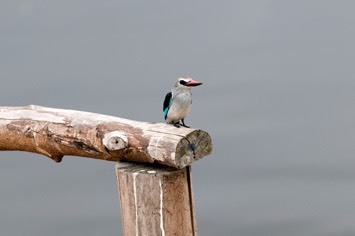 There were also lots of bee-eaters and we saw African grey parrots quite frequently! 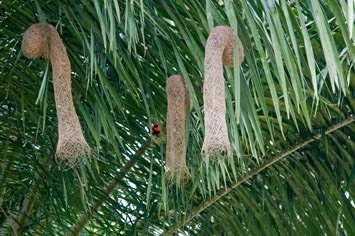 The most amazing nests we found were those of the malimbes, a species of weaver bird. 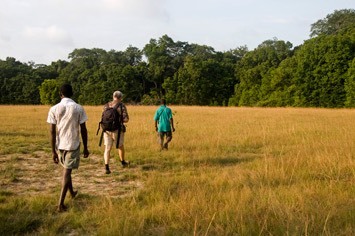 The habitat around Setté-Cama is actually one big mosaic of forest, savannahs, beaches and waterways. 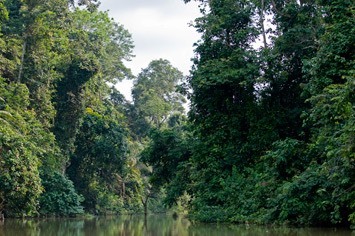 The dense rainforest borders right onto the lagoon, but in the middle of it you can suddenly emerge into open patches of savannah with short grass. There was plenty of evidence of elephants, but the only animals we saw in open savannah was a small group of buffalos, which ran as soon as we approached them. The open bits are great for seeing African grey parrots flying overhead though! On one of our walks, our boatman accompanied us, and, to our amazement, he walked the entire way barefoot! 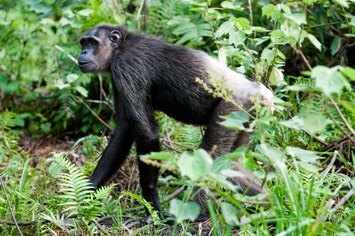 This was actually the walk where we came across a truly wild chimpanzee. Jean-Alain and his friend suddenly stopped, as they could tell from the very quiet noises they heard that a chimpanzee was around. We were just behind a tall, fallen tree, and when Mick poked his nose around it, he could just see the arm of a chimpanzee who had obviously been watching us and dropped down from a tree to disappear! Unfortunately, Maren didn’t manage to see anything other than the empty tree! 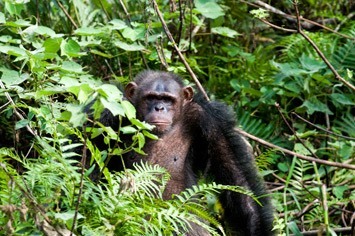 But it just goes to show – with a bit of luck you can even see a wild, unhabituated chimpanzee! After a few days full of walking trips, Jean-Alain decided to give us half a day “off”, so he took us to the only village located in Loango National Park. As it happened, his pipe-smoking aunt lived there, and it turned out that the main purpose of the trip was to buy dry salted fish. 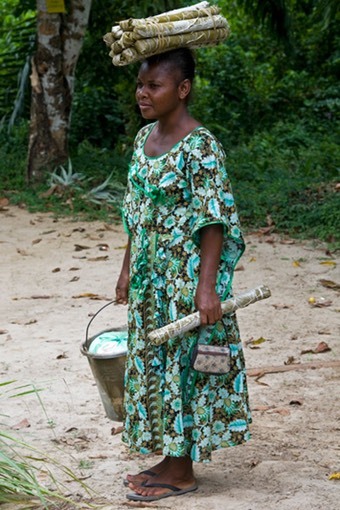 Another lady from Setté-Cama came along. We went by boat and then walked a short distance to the village. 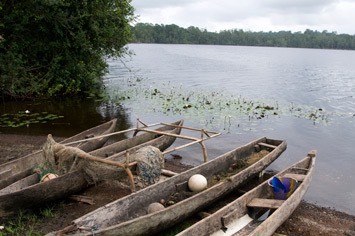 On the shore we were greeted by some of the traditional, and still widely used, dugout canoes. 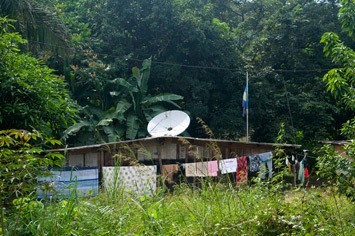 Despite most houses of the village being quite primitive and the kitchen being located outside, there was the obligatory satellite dish, which we saw in even the most remote places in Gabon! How else can they follow the football results from abroad? We were allowed to look around the buildings and the garden and were proudly showed a trap for porcupines. They made some music with traditional harps and then offered them to us for sale, together with some not very refined carvings. After that the haggling for the fish started. The price per kilo was fixed, but, as there were no scales at hand, the bargaining was all about how heavy each piece of fish was. It was very amusing to hear the lady scream in disbelief whenever a price was proposed to her. Really, this is where a video camera was necessary, although some of the people were not keen on having their photos taken. 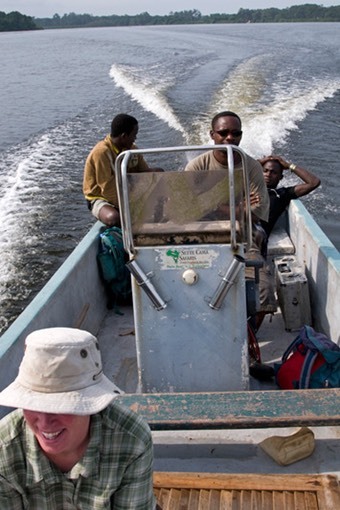 Laden with fish and maniok, we then headed back to the lodge. 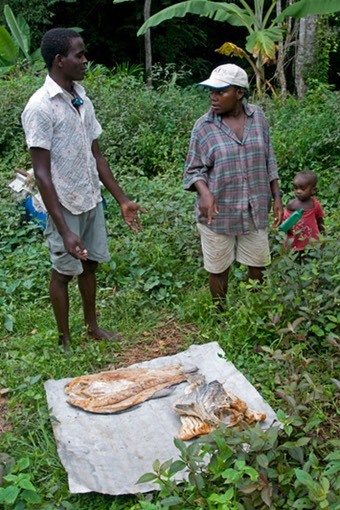 The dried, salted fish was served to us the next day, and it was one of the most awful things served to us during our whole stay in Gabon! It was just way too salty! 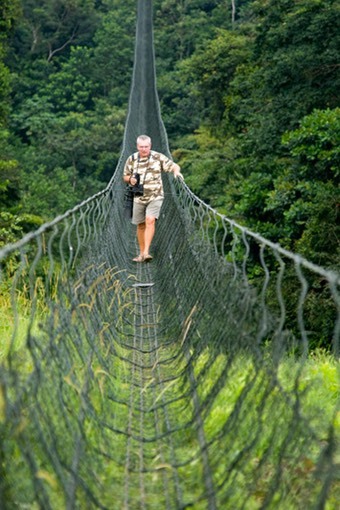 One day we went into Loango National Park itself. 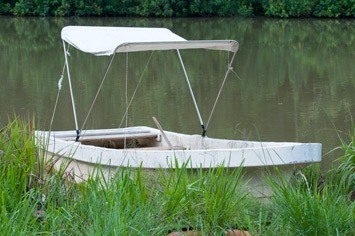 We took the boat across the lagoon and were dropped off in the middle of a mangrove swamp. We had to jump from the boat into the mud, so when we made it to firm ground, our lightweight running shoes had taken on a slightly different colour to when we started! We were told that if we were charged by angry buffalos, we should run, while, if charged by an elephant, we were supposed to hide behind a tree. At first the going was good, but then we came across an extensive muddy and wet area that we had to cross. Jean-Alain simply told us to follow his footsteps without taking into account that we would just sink in deeper and deeper than he had. It was rather a struggle. On one occasion we had to balance over some small fallen trees, and Jean-Alain eventually organised us some sticks to hold on to while balancing across. We arrived even muddier on the other side, and Jean-Alain seemed to think that we were a bit stupid not to get across without getting dirty and wet. His mood didn’t improve, when Mick suddenly shouted “Stop!” when he spotted a forest elephant hidden in the bushes not very far ahead of us. Jean-Alain hadn’t noticed the elephant, so his guide’s pride was a little wounded! Fortunately, the elephant was the first to run, which was certainly a good thing, as there weren’t many stout trees around! 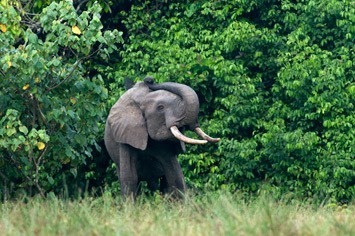 It is a rather amazing thing to actually meet a forest elephant in the forest! You can see why they have a reputation of being aggressive, as it is really easy to just stumble across them, despite their size! 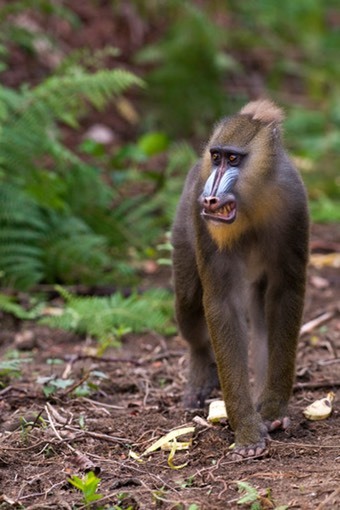 We continued walking with a slightly grumpy Jean-Alain and managed to spot some more monkeys high up in the trees, as well as two species of duiker. After some hours we began to hear the sea and emerged from the dense forest onto the beach, where the two other guys were waiting for us with a picnic lunch. They had walked all the way around the sand spit up the beach to meet us. We enjoyed cold chicken and some wonderful mangos for dessert. 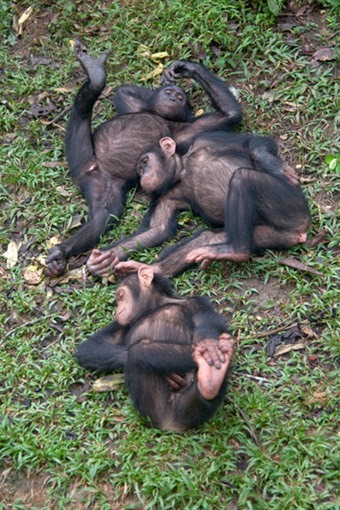 Afterwards, our African friends seemed to be in dire need of a siesta - at least they didn’t stir for ages. We felt that we just wanted to continue, so, after a short break, we went looking at the crabs on the beach. Eventually, the others stirred again and off we went. Not long after Jean-Alain stopped and told us that there were elephants up ahead. 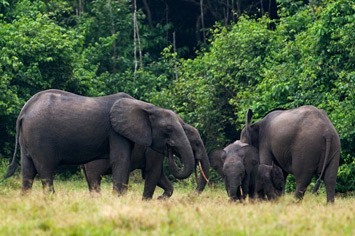 At first we couldn’t see them but eventually we spotted a small family group grazing just outside of the forest. We slowly approached, always trying to stay down-wind from them. There were five elephants, including a tiny, very hairy calf. 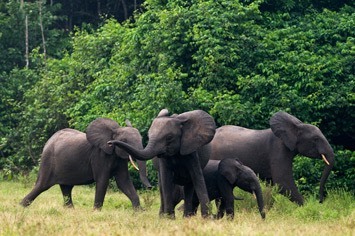 We watched them for quite a while from not very far away, but the moment the matriarch caught our scent they disappeared very quickly into the forest. 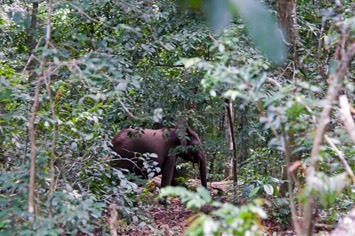 Not long after that we came across the next elephant feeding close to the coast, just outside the forest. This time it was a bull. He seemed a bit nervous and kept lifting his trunk, trying to figure out who we were. 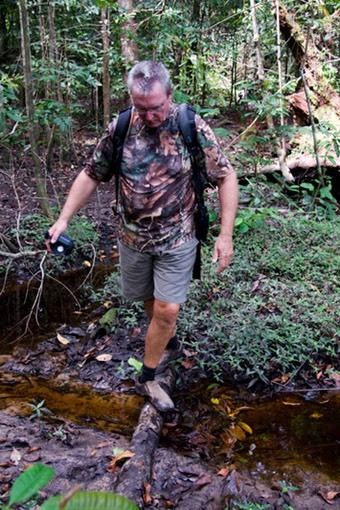 He moved back and forth, but only when Jean-Alain approached him did he disappear into the forest and let us pass. A little later we came across at least two more elephants. They were feeding behind some bushes and were not so easily visible. 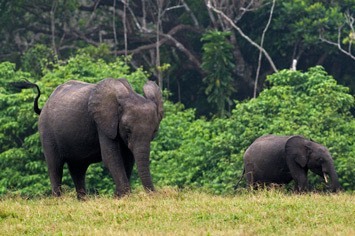 Also, Jean-Alain seemed to think we had seen enough elephants for one day and that it was time to head home. So we didn’t even really stop for these guys, which was a bit of a shame. The walk home turned into a bit of a route march, with our guide setting a very fast pace and us trying to scramble after him. The last bit on the beach was especially hard work, and we felt it would have been better to have a shorter lunch break and a bit more time to watch the elephants on the way home. 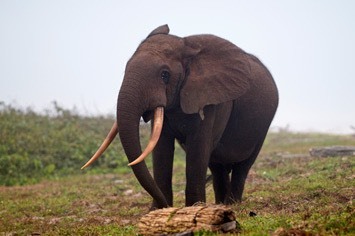 But it was certainly a very successful day for spotting forest elephants - we saw a total of nine animals, one of which was a "proper" forest elephant! And we managed not to be charged by any of them, because hiding behind a tree would have been rather difficult out on the open beach! We did two walks with other guides. One was a young lad who took us into the forest. He was very good and explained a lot about the various tree species and their medicinal properties. And he was much more considerate when we came to a very muddy bit. 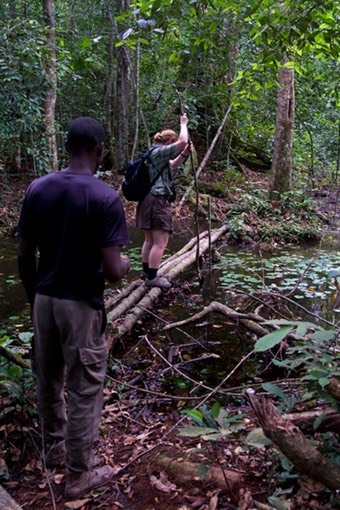 He immediately organised walking sticks for us, and helped us across all the small stick bridges. At one point we even found an elephant tooth! 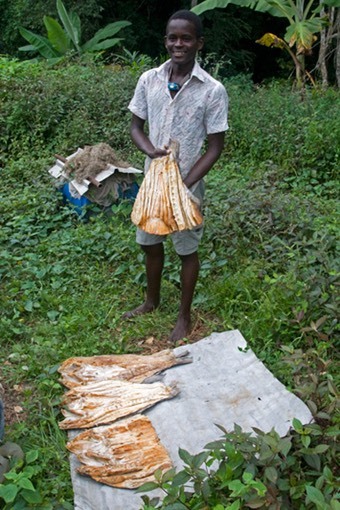 These teeth are pretty big and heavy, and it’s quite bizarre to think of an elephant loosing such a big thing. They renew their teeth quite frequently, going through six sets in a lifetime. The other tour with a different guide was along the beach. We always did the beach walks in the afternoon, as the light was, apparently, better then. Most of the time it was quite hazy though. One day we saw some buffalos on the beach, but, unfortunately, no surfing hippos. 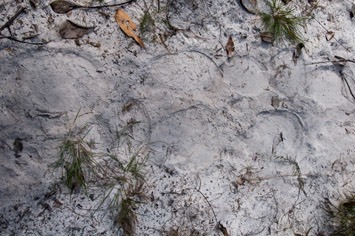 The footprints of elephants were everywhere, and, during most of our walks, we were following the paths made by elephants, buffalos and sitatungas. 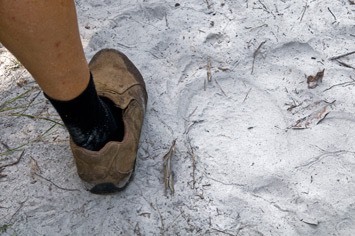 Most of the time we walked in the footsteps of elephant, which were surprisingly small; only about as big as Mick’s feet (size 45). The amazing thing was that, during our entire time in Setté-Cama we only once encountered other human footprints – and they were our own, made during a previous walk! While walking with the other guide we first spotted a very distant sitatunga, and later came across a very splendid lone elephant bull. 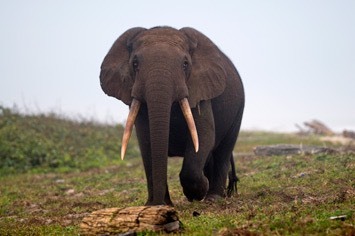 He was sporting impressive tusks and was feeding on the sparse vegetation of the beach. He showed us the technique used by elephants of grabbing the vegetation with their trunks and using their feet to cut it off and shake the sand out before eating it. He was pretty close and seemed even bigger when he turned towards us and started walking in our direction. We were wondering what to do should his mood change, as there were definitely no trees, not even tiny ones, anywhere near us. 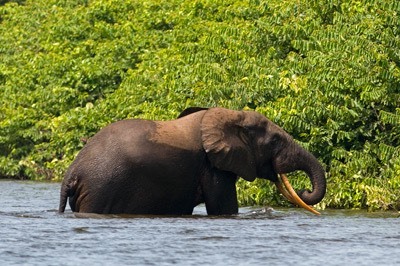 How far would we have to swim out to sea to shake an angry elephant off? Our guide was good though. We retreated into the open, and, when the elephant saw us, he decided to peacefully head back into the bushes and let us pass unmolested. 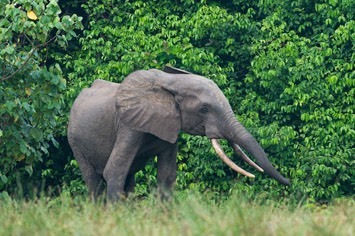 It is a very exhilarating experience though, to be so close to these enormous creatures on foot! It feels very different to seeing them from the safety of a car in East Africa. 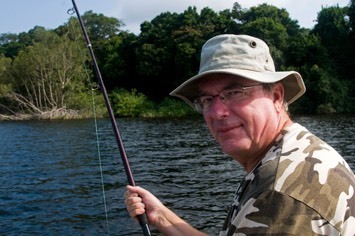 On our last full day we went fishing in the lagoon. Two fishing rods were brought out with plugs and towed around the lagoon. 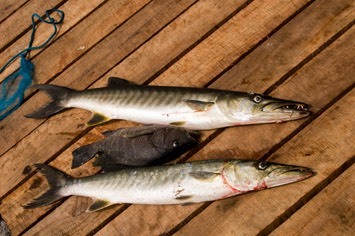 Not much happened for most of the time, but we did catch three fish: two barracudas and a small carp rouge. Guess what we had for dinner? Mick also caught another carp rouge, this one a pretty big one, but, as it is the way with really big fish, it was the one that got away! Probably the most amazing thing during this trip was to come across a manatee. Unfortunately, we were going along rather fast, and all we saw was the disturbance on the surface created by the manatee as it dived to get away from us. Manatees are apparently quite common in Ndogo Lagoon, but they spend their secret lives mainly in the mangrove creeks and are not all that easily seen. Overall, one has to say that going for walks in the rainforest is a very amazing experience. 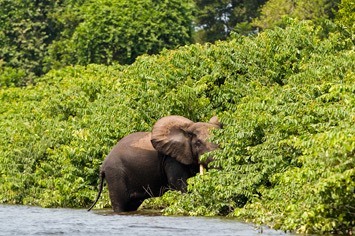 One just doesn’t know what is hiding behind the next bush – it could even be a forest elephant! 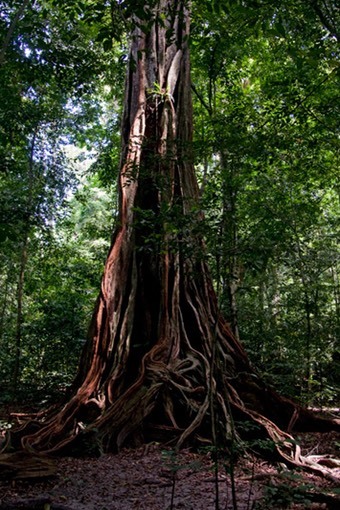 However, the rainforest is a difficult habitat in which to spot wildlife, and for people who want to quickly tick many species it can certainly be frustrating. During our stay in Setté-Cama we saw 14 forest elephants, two groups of forest buffalo (one group on the beach), sitatungas, several groups of hippos, a blue duiker and another species of duiker (We were not sure if it was an Ogilby’s or white-bellied duiker. That got lost in the translation). We also encountered two species of squirrel. 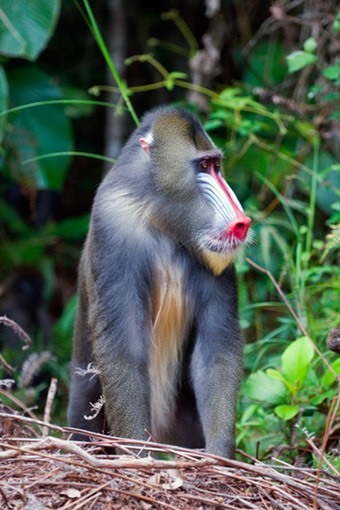 Of the monkey species we saw red-capped and white-cheeked mangabeys, putty-nosed monkeys, crowned monkeys and mustached guenon. Most of these sightings were not very good, as the monkeys were high up in the trees and often legging it as soon as they spotted us. 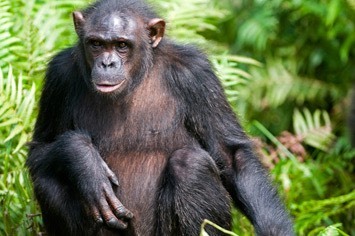 And, Mick saw an arm of a wild chimpanzee. 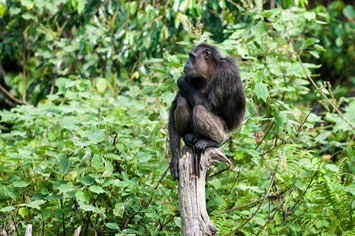 We didn’t get to see any gorillas, but they are occasionally seen in the area. What we didn’t see at all were the nocturnal species of carnivores, as we were always safely tucked up in bed when they went on the prowl. The only nocturnal animals we saw were the bats whizzing around our heads and the lights, when we were sitting on the terrace in the evenings to have dinner. 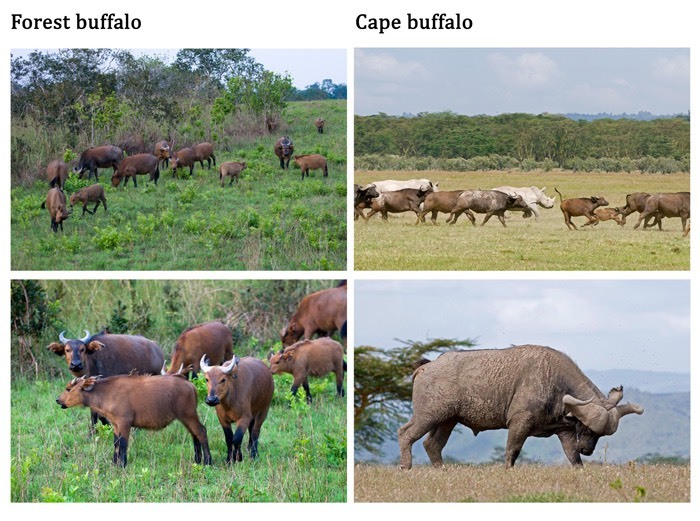 It was astonishing to see the difference between the West African forest buffalo and the Cape buffalo that we knew from East Africa, as well as the difference between forest and savannah elephants. We made a photographic comparison of these species to show their differences. Although they are officially the same species and only separated into subspecies, the forest and Cape buffalos are very different in appearance. 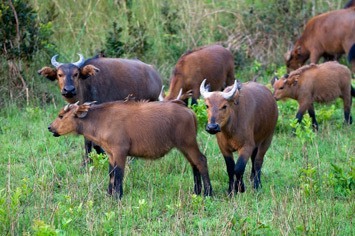 Forest buffalos are much smaller, reddish in colour with smaller horns and appear to be much more docile than the usually pretty fierce Cape buffalos. 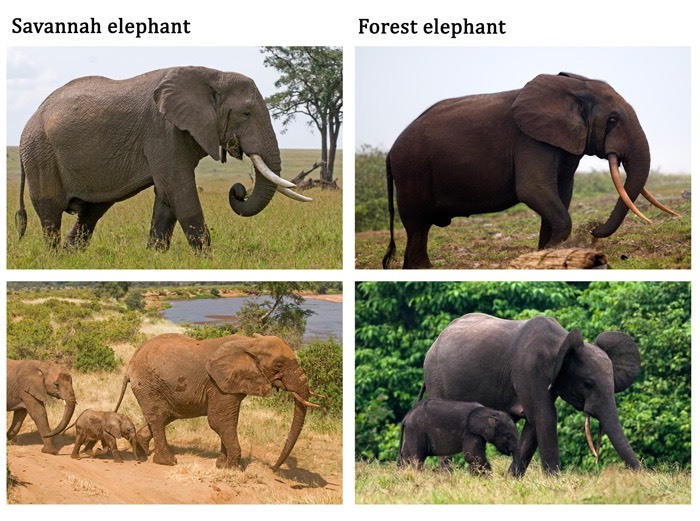 Forest elephants are now known to be a different species to the savannah elephants and they are found only in the dense forest habitats of West Africa. 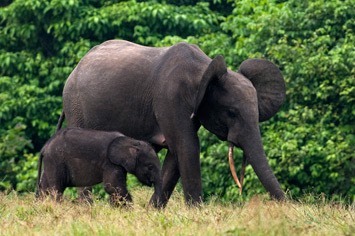 The forest elephants are overall rather smaller than their savannah cousins. Their ears are smaller and much rounder, but the main difference that we found were their tusks. The colour is different, and they are much more downward pointing, rather than curving forwards and upwards as do the savannah elephants'. The little calf we saw was also was much hairier than its savannah counterpart. 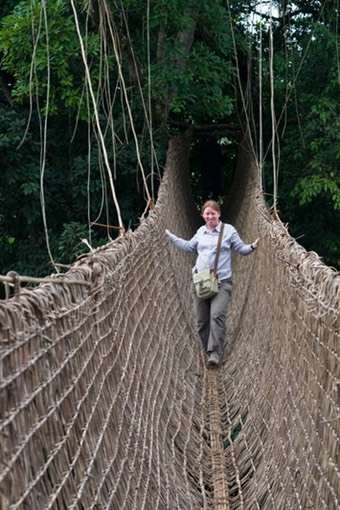 Setté-Cama was a great base from which to explore the area south of Loango National Park. 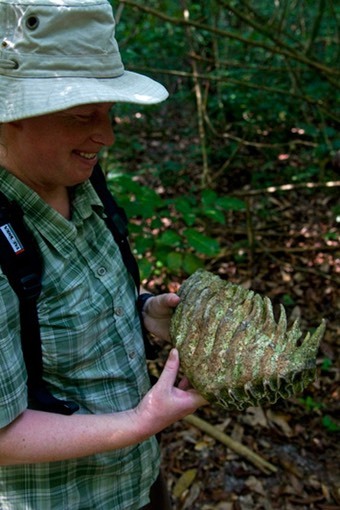 It’s got very varied habitats with the lagoon, the dense rainforest, open savannah areas and the beach. 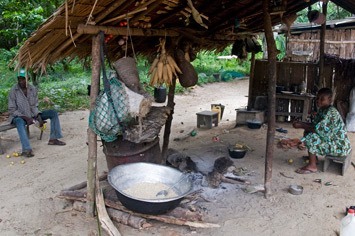 The only thing missing in this area are the famous bais found in other areas of Gabon. However, there is plenty to explore and we only repeated one walk on the beach. Sightings of mammals were not as plentiful as one has during a safari in East Africa, but to encounter all these animals on foot and to feel truly like walking in their habitat is a very special experience. 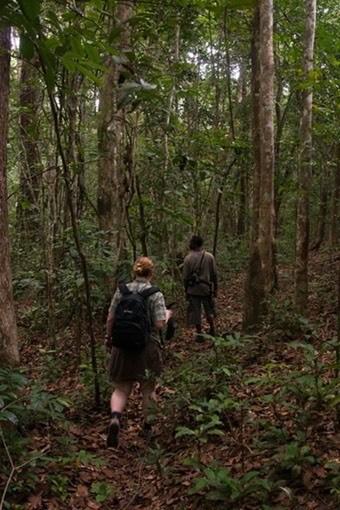 Meeting forest elephants and walking up to within 50 m of them is very exciting. Setté-Cama Safari Lodge was refreshingly simple but comfortable, and Annie looked after us very well. She always made sure that we had plenty to eat, and, despite being served fish at least once a day, the food was always varied and we had lots of salad and fresh fruits. When you know that most the food gets flown in from Libreville and then taken by boat, you truly appreciate it. When we asked if we could get our laundry done, Annie was quite happy to do it for us. Our little chalet was perfectly adequate and the cold showers were very welcome after coming back hot and sweaty from our expeditions into the jungle. They were not quite so welcome first thing in the morning though… Due to the proximity of the lagoon there were plenty of mosquitoes around. 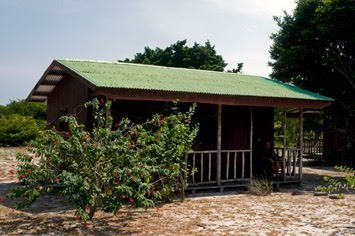 Mosquito nets were provided in the chalets, but taking anti-malarial drugs is essential! Having the whole of Setté-Cama Safari Lodge for ourselves and not having any other persons with us on the walks was great and we felt very privileged, although it is obviously a shame from the locals’ point of view that not more people visit this pristine place. Jean-Alain, our guide during most of our walks, was very knowledgeable. He told us that he had worked with film crews from the BBC in the past. He actually speaks reasonably good English, which he only let on during our last walk! 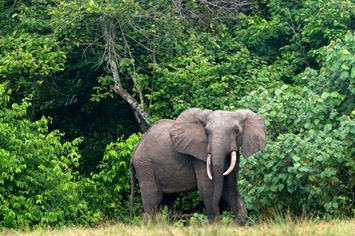 Except for missing the elephant in the forest, he was always very vigilant, and we never felt worried during our walks. The one annoying thing was that our walks never started at the time we were told, but usually at least 15 minutes late. Especially in the afternoon the consequence was that walks on the beach ended in route marches, as we had to reach our boat before darkness. The idea of walking with elephants at night was not quite so appealing… On our last afternoon we were kept waiting for a whole 45 minutes, which was obviously rather disappointing! According to our flight schedule, we were not supposed to leave Gamba until the late afternoon, so we had planned for a small excursion in the morning. Upon checking with the airline, Jean-Alain told us that the flight time had been changed and we had to set off from Setté-Cama first thing in the morning. That was a shame, as it meant we spent another half day in the Tropicana Hotel in Libreville instead of looking for more forest elephants. On our departure day we kept our room in the hotel as a dayroom, and were picked up by François in good time to take us to the airport for our evening flight to Frankfurt. 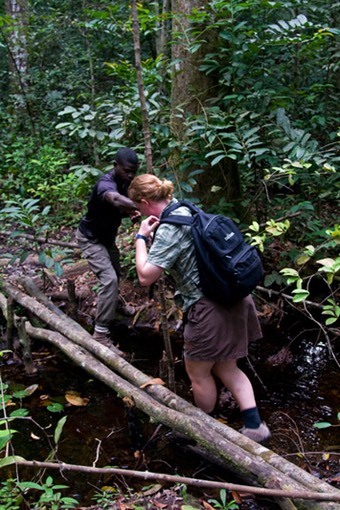 In summary we can say that we had two very memorable weeks in Gabon, during which we saw lots of new species for us (not all that we could properly identify). We didn’t mind not seeing gorillas in the wild, as we had an amazing gorilla experience in Lékédi, albeit not with truly wild animals. Meeting the forest elephants on foot was certainly a dream come true. 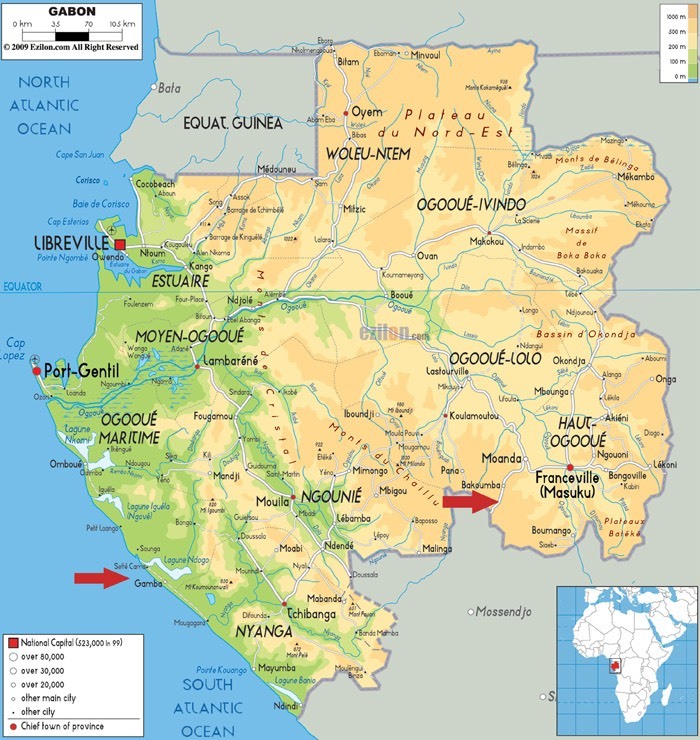 If we get a chance, we would certainly like to explore Gabon further and visit some of the places we couldn’t get to during this visit.